About – Dominguez & Sons Trucking, Inc.
Dominguez & Sons Trucking is a family-owned business headquartered in San Jose, California. The company was founded in 1976 as a family partnership. Incorporated in 1986, Dominguez & Sons Trucking, Inc. has been focused on scrap-metal transfer/drayage via high-side trailers since 1997. 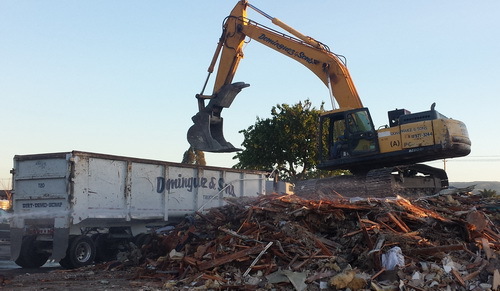 Our high-side trailers and end-dumps have proven to be invaluable to local demolition contractors as well. Fast dispatch and competitive pricing has been unmatched by our competitors. Area of operations includes the San Francisco and Monterey Bay areas, as well as the Sacramento region and greater Central Valley. Dominguez & Sons Trucking, Inc. is a partner with One Stop Shop Truck & Trailer Repair, located at 1346 East Taylor Street in San Jose 1-408-971-9901. One Stop Shop provides business-to-business tractor and trailer maintenance and repair services to the local trucking industry.